After consolidating for the past week, sterling traded sharply higher versus the U.S. dollar on Wednesday. While growth in the fourth quarter was confirmed at 0.7%, private consumption was revised up to 0.8%. Government spending was also revised to 1.1% from 1.0% and these healthy revisions drove GBP/USD to its strongest level in nearly 2 weeks. In response to this move, many traders are wondering whether sterling is in the process of carving out a bottom against the U.S. dollar. From a fundamental perspective, there are many reasons for us to be skeptical of the GBP/USD rally. GDP was revised higher but this is a backwards looking report while the UK-US 10 year yield spread moved in favor of the U.S. dollar today, which is bearish for GBP/USD. 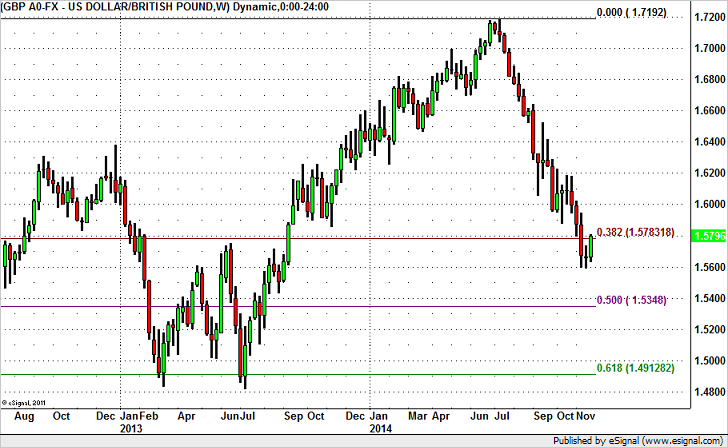 There’s also not much on the U.K. calendar next week so the outlook for the currency pair hinges on the U.S. Beige Book and Non-Farm Payrolls report – both of which will most likely be positive for the greenback and negative for GBP/USD. On a technical basis, 1.5785-1.5800 is an important resistance zone for GBP/USD because it marks the 38.2% Fibonacci retracement of the 2009 to 2014 rally. If broken, we expect to see the currency pair squeeze as high as 1.60. However if this level holds, so should the 1.56 to 1.58 range in the near term.